Hazel Keech had blockbuster Ganesh Chaturthi celebrations on Thursday and made plenty of good memories. The actress shared a list of her favourite memories from last evening on Instagram and added an interesting caption to the album: "Happy Holiday spent with friends and family, and friends that become family. Happy Modak day aka Ganpati bappa morya!" she wrote and tagged Sagarika Ghatge and Zareen Khan, who were also present at the celebrations. Hazel and Yuvraj Singh, who appeared to be at the Ambani party, caught up with Zaheer and Sagarika and posed for photos of course. Hazel's photos also offered sneak peaks from inside the mesmerising decor at the Ambani Ganesh Chaturthi puja. Hazel was pretty as ever in a white suit, which she paired with beaded danglers. Sagarika was stunning in a saree from the collections of Raw Mango. 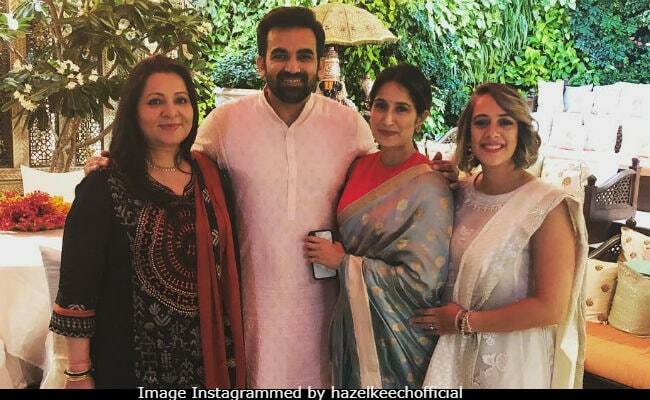 Here's how Hazel summed up her Ganesh Chaturthi celebrations in five pictures - Yuvraj, who is tagged in the post, is missing from the photos. Hazel also celebrated the first day of Ganesh Chaturthi with friends. "Wishing everyone a very happy Ganesh Chaturti," she wrote. The Ganesh Chaturthi puja hosted by the Ambanis had an impressive line-up of guests, which were headlined by A-listers such as Amitabh Bachchan, Shah Rukh Khan, Salman Khan and Aamir Khan. Other guests who attended the party also included names like Kareena Kapoor, Katrina Kaif, Hema Malini, Rekha, Karan Johar and others. Hazel Keech, who participated in Bigg Boss 7 in 2013, has a brief career in films. She appeared in films such as Bollywood's Bodyguard and Tamil project Billa. Hazel Keech and Yuvraj Singh married in December 2016.